The Commercial Enclosed DE Lighting System is state-of-the-art double-ended technology that uniformly delivers optimum PAR value over a broad footprint. 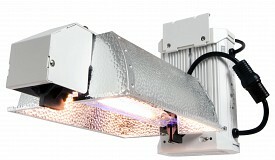 The Commercial Enclosed DE Lighting System gives you the unique ability to remove the ballast from the reflector so it can be used remotely, allowing you to operate the ballast outside of your grow room, to effectively reduce heat load. Be the first to review “Commercial DE Enclosed Lighting System, 240V” Click here to cancel reply.